Little Treasures has given birth!! – Nappy Babies! I am very proud to announce the new little arrivals at Little Treasures Kettering HQ! I present to you the wonderfully cute…. 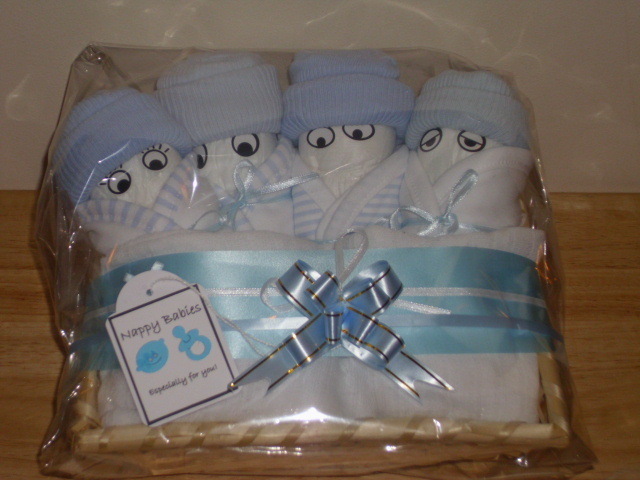 I have created these Nappy Babies using only the best Pampers Nappies (size3), Cotton Socks, Cotton Bibs and the Set of 4 include a Muslin Cloth too. The best part everything is completely practical and usable! All bunched together they will keep each other nice and snuggly until they have homes to go to. All ready for their new homes! They look such a cheeky bunch….ooo let us be quiet I think the one on the end is falling asleep…SSssssshhhhhh! If you love my gifts please give me a vote here – It would mean so much! Thank you for looking and for sharing this exciting new gift launch with me! Would love to hear any feedback below……. Next Nappy Baby Needs a Bed!